Fronbach Cariad was purchased for the Fayre Oaks sale specifically as a wife for Beau and we couldn't have been more pleased with the result of this cross Norash Beauson. Beauson was purchased by Amilas Stud as a foal, their first Section A, first stallion, and has been an outstanding foundation for their stud. A supreme Champion in hand and winner at the major shows in the UK including The Royal Show, Three Counties, Essex County, etc and top three placings at the major shows for welsh ponies such as The Royal Welsh, Glanusk and Northleach. 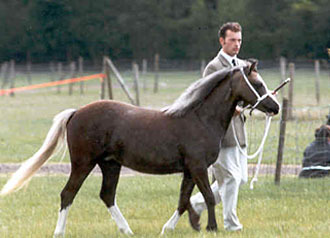 He has also been shown under saddle qualifying for the NPS Piction final in 2001 He is now the sire of Supreme Champion stock including Amilas Chutney Supreme Champion foal at East Anglian Native Pony Society, an award also won by Beau as a foal. 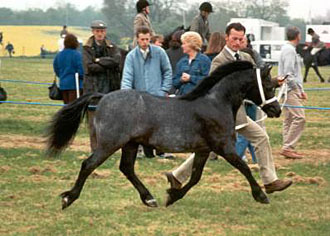 Beaugest's show career got of to an outstanding start when he stood Supreme Champion at West Midlands Foal Show at just 6 months old. Successfully shown as a youngster the decision was made that his future was under saddle and he was gelded. This proved to be the right decision to make as he has done extremely well under saddle qualifying for and being placed at the Ponies UK and British Show Pony Society Championships. Beaugest is now happily settled with the Lamb family where he has won in-hand and under saddle on and off the lead. Teesha is one of three very successful full sisters. 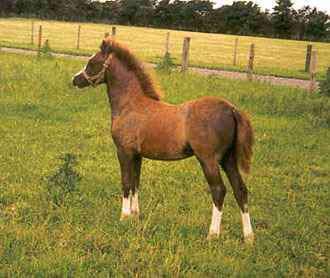 All three sisters like their dam born liver chestnut (photo right as a yearling) and over a number of years and very slowly turning grey. Another 'Beau baby' that was a very successful youngster her wins including 1st at Three Counties in the same year as Norash Beauson won the 3yo Colt class. A reduction of the stud saw Teesha start of her journey through a number of studs where she left outstanding fillies to continue her line. She is now owned by Passedena stud where she has just given them yet another filly. Successfully shown as a youngster, by various studs. and having left her previous owners with a beautiful filly foal, to replace her Tamerisk, now a beautiful rocking horse dapple grey, has returned to Norash as a brood mare. 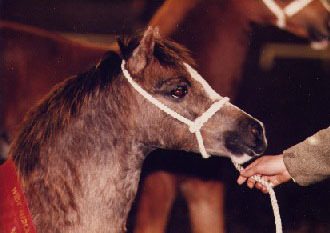 Grenade is another successful Beau Son, one of only two or three still entire. 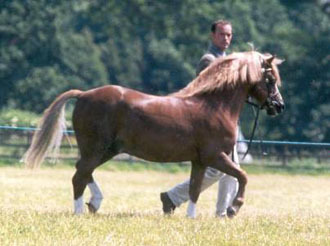 Bred by Vervale Stud and owned by Mrs. P Shepherd he is a Supreme Champion in-hand and although still quite young is making his influence felt as a sire. His first crop of foals (2003) for Thistledown stud are showing great promise and he is also the sire of Norash Peek-a-boo an exquisite filly purchased by Amilas Stud.